While we sleep, they work, and when they sleep, we reap the rewards. 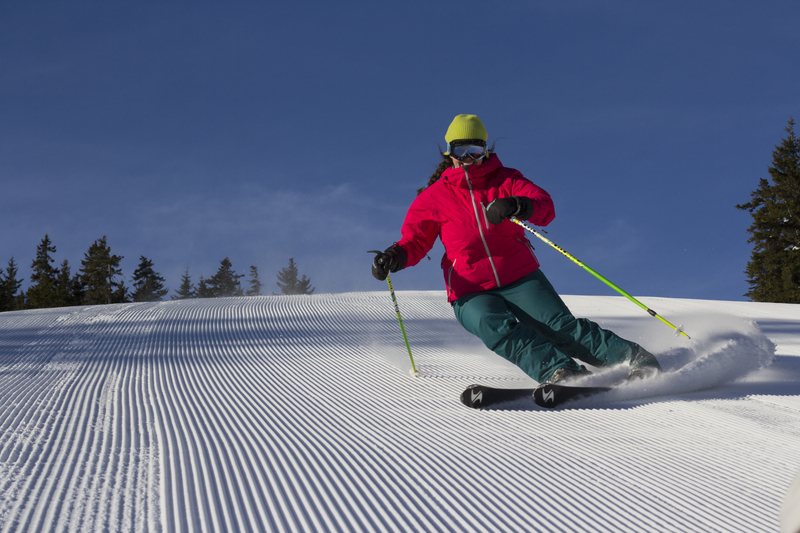 To learn more about what goes into creating consistent cord, I hit the hill with Steve Cross after a 14 inch snowstorm, where I experienced the snow transformation first-hand. 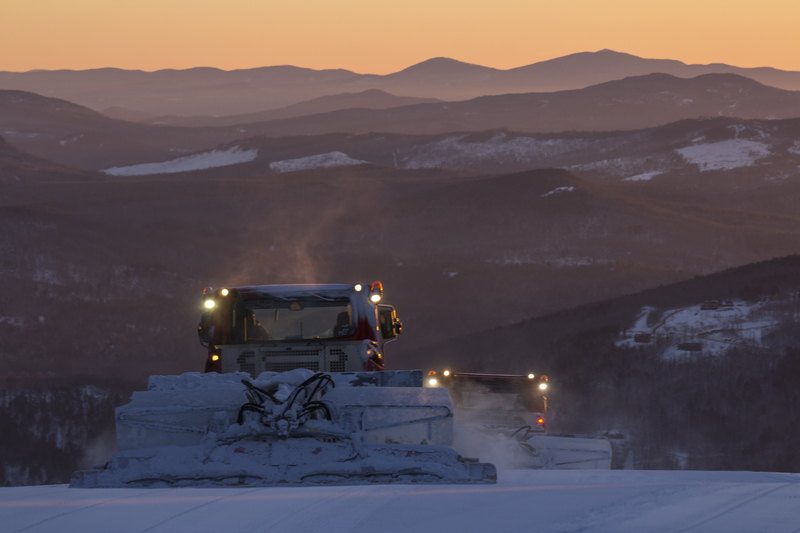 Groomers working hard and enjoying the scenery, too. From an outsider looking in, grooming never struck me as hard. I mean, you get to drive around in a powerful, yet comfy machine complete with heat and a stereo. I quickly learned that grooming is anything but easy. The complication of machinery, changing terrain, and the always variable snow conditions all impact the method of madness and the final product. Wolf pack? More like cat pack. Steve explained to me a few of these different situations. For example, a “freeze-thaw” happens when the temperature warms the snow then drops suddenly to create an extremely hard surface that needs to be “chewed-up.” Likewise, heavy snowfalls, while extremely fun, also complicate things and require a little extra work. 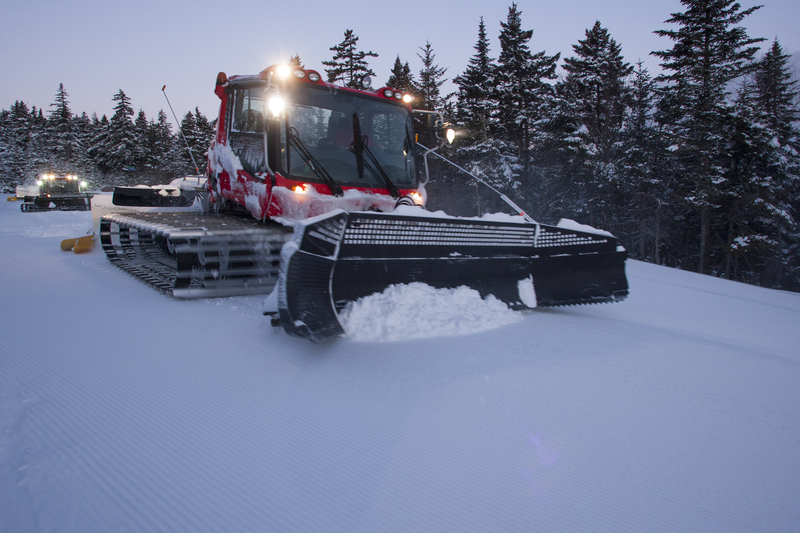 In fact, powder day grooming is twice the work as non-powder days. As well, warm spring-like conditions force groomers to pick up speed otherwise the product left behind will ball up into (dare I say it) cookies. Riding in Steve’s groomer, I saw the mountain from a completely different perspective. With no lights and traveling uphill, it was easy to lose sense of direction. At one point, while climbing the headwall on Right Stuff, we were moving over a wind drift that caught the tracks causing the entire machine to begin sliding. My anxiety clearly wasn’t on Steve’s radar because with a few quick adjustments, we were pulling out of the surf and on our way to the summit. “We just got stuck in a decent amount of loose snow,” Steve commented while turning to me. “Fun, isn’t it?” I couldn’t help but smile. 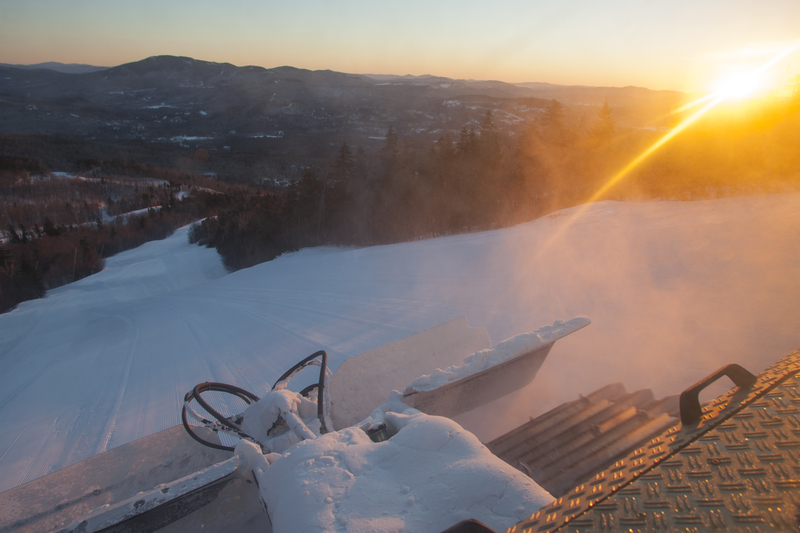 Groomer tilling its way up American Express during a beautiful sunrise. After two hours of riding in the Steve’s snowcat, we turned the well-tracked powder of Monday Mourning, Race Arena, T2, Lower Upper Cut, and Right Stuff into soft groomies, which I couldn’t wait to ski on the next day. The transformation from flab to fab right before my eyes was astonishing. Steve drove me back down to the base and I was overwhelmed that he had another 78 trails to go in a matter of hours. My initial opinion of the life of a groomer vanished. I hopped out and in typical grooming form, Steve waved farewell by flapping the top corner of the front blade before returning to the pack. Adoring the grooming team’s hard work.